You are at: Home / Agora / Pandora's box ajar for Turkey and Greece? On the Turkish side, the desire was, seemingly, to make an opening to Europe after the souring of relations with the European Union in general and Germany in particular. The pro-government media in Turkey announced plans for the visit as early as late November; even before the official invitation was sent to Ankara. According to Turkish press reports on November 22, one of the key targets of the visit was initiating the "Istanbul-Thessaloniki fast train project" or "the fast track to Atatürk's hometown" as Akşam, a pro-government daily put it. The Greek side was expecting the visit to be cleanly framed and limited to cooperation on economic and refugee issues. But then the "Lausanne Crisis" erupted right before the visit. One of President Erdoğan's frequently cited mottos these days is: "We might arrive unannounced one night," meaning Turkey is omnipotent and might surprise enemies. 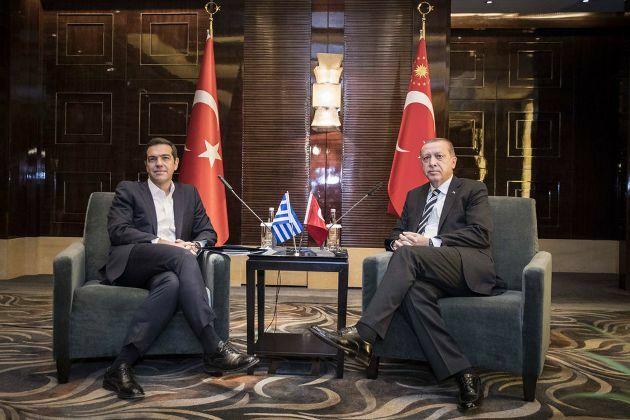 Prior to and during his visit to Greece, Erdoğan did emphasise "friendly relations and neighbourly behaviour" but his Lausanne remarks made an unannounced visit. He is a man not known for mincing his words but were the Lausanne Treaty revision remarks planned beforehand? Did Erdoğan take an impromptu step of mentioning revision when the Lausanne Question came up during the Kathimerini/Skai interview? There was no indication that revision of Lausanne was on Erdoğan's or the government's agenda. Last time that Lausanne became an issue was in September 2016, when Erdoğan was conducting his regular meetings with the mukhtar - the locally elected district administrators - at the Presidential Palace. In his speech to the mukhtar, Erdoğan claimed that the "Lausanne Treaty was a failure portrayed as a victory." He also mentioned that "Turkey had to give away the Aegean islands, so near that once somebody shouts the voice is easily heard from the other side" as a result of Lausanne. He added that "Those lands were ours. We have our mosques, temples there, but we are now debating what shall happen in the air, at the sea...". At the time, the "Lausanne failure" debate took a diverse domestic turn: the secular and Republican circles saw it as an insult to Atatürk and the discussion fanned the flames of internal polarisation. Now, the Lausanne controversy has been resurrected. But this time, if Turkish media headlines are to be taken as the guideline, echoes of the debate takes a more unified and nationalist tone in Turkey. Almost all the newspapers came out with the same headlines; "Erdoğan has brought Greece into line." In fact, the front pages of almost all Turkish newspapers were dominated by two foreign affairs crises; half of the pages were devoted to the Trump administration's recognition of Jerusalem as Israel's capital, and the other half to Erdoğan's tough stance, "fine tuning Greece so it can return to its senses" through his discussion about revising the Lausanne Treaty. Following the "Netherlands-Turkey diplomatic crisis" prior to the 2017 referendum in Turkey; there are other foreign policy crises developing with Greece, the US and Israel. These are the three countries which the Turkish nationalist and conservative psyche does not really favour. The crisis with Greece is reminiscent of the Netherlands-Turkey crisis in March 2017. This was when the Turkish government's efforts to hold political rallies for the "Yes" campaign ahead of the presidential referendum on Dutch territory resulted in the expulsion of the Family and Social Policies Minister Fatma Betül Sayan from the Netherlands. Will the Lausanne controversy with Greece continue? Will President Erdoğan pursue a similar approach akin to Hungarian Prime Minister Viktor Orbán's policy of rallying ethnic Hungarians in Transylvania? The Netherlands-Turkey crisis died down soon after the referendum in Turkey (and the almost simultaneous Dutch elections) passed. There are no upcoming (scheduled) elections in Turkey until 2019; but, currently the ongoing trial of Reza Zarrab in the US for breaking sanctions against Iran is proving to be a headache for the government. This is because old corruption allegations, dating from 2013-14 and implicating some former ministers, as well as Turkey's state banks like Halkbank, are resurfacing during the trial. While it is generally agreed that Turkey's government is immune to corruption allegations, the trial might have economic consequences for Turkey if multi-billion dollar fines are imposed upon Turkish banks involved in sanction-busting actions. In any case, Erdoğan's visit was supposed to be reinforcing the positive ties between Turkey and Greece; but now the two countries have new frictions to overcome. The Netherlands-Turkey crisis was easy to resolve once initial tensions were left to die down by politicians from both sides. In the end, the Netherlands is not next door to Turkey, and the Dutch happen to be among top trade partners of Turkey, so escalating the crisis would hurt Turkey economically. But, Greek-Turkish relations already carry historical baggage and there are deep traumas in the nationalist psyche of both sides. So, once Pandora's box is open for the sake of domestic politics or any other reason by one side or the or the other; it might be difficult to close it because of the re-emerging resentments. If resentments reinvent themselves in a religious form, they might be even harder to overcome. Moreover, it is the minorities on both sides who have to face the hardest challenge if there is increasing xenophobia and discrimination. And, of course, Turkey and Greece need to cooperate to end the humanitarian tragedy of refugees across the Aegean Sea and, increasingly, the border in Thrace. But, we are back to the future, battling with early 20th century ghosts instead. *Sezin Öney is a journalist and a political scientist from Turkey, based in Budapest and Istanbul. Her interest in her subject area populism was sparked about a decade ago; she focuses specifically about populist leadership, populism in Turkey and Hungary. She studied International Relations, Nationalism, Austro-Hungarian history, Linguistic Rights, the Kurdish Question, Comparative Politics and Discourse Analysis. As a journalist, her specialization is on European affairs and global politics. Ever since Iran became the unintended victor of the MidEast conflict, Turkey is desperately trying to justify its losses by raising issues "elsewhere".